The mathematics that we all learn in school is great. No, really, it is. How can anyone get through life without knowing how to add or subtract. Multiply or divide. Solve for an unknown or factor a polynomial. OK, you might be able to get through life without that last one, but the point still stands, the mathematics that we all learn in school is great. It isn’t everything though. There are a lot of other tools that mathematics has to offer that could enrich people’s lives. 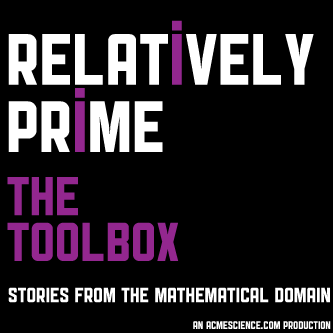 On this episode Samuel Hansen rummages through his mathematical tool box and showcases three tools he feel are going to be very important in the coming years. Game theory has numerous applications in economics and political science, but thanks to the new book by NYU Professor Steven Brams, Game Theory and the Humanities, it has broken out of its shell and started to play in the same realm as Shakespeare and the Bible. Samuel spoke with Professor Brams at the 2012 Joint Mathematics Meetings in Boston. Risk is a word that can mean anything to anyone. From a technical perspective it is probably best defined as the probability that an action will lead to a negative result, but that is not the definition that most people have in mind when they hear the word. For them risk can be a person, risk can be an action, a loss, or even what makes you feel alive. Risk can have to do with death, with money, or with security. She could be a risk, he can risk it all, you might be told to just take a risk, and you definitely shouldn’t risk your life on getting anyone to agree on a definition of risk. In order to clear up these problems Samuel tracked down two of his favorite Risk minded thinkers. First on the list he spoke with the Winton Professor for the Public Understanding of Risk, as well as the man behind Understanding Uncertainty, David Spiegelhalter. Then he tracked down the stand-up mathematician Matt Parker, co-creator of Your Days are Numbered: The Maths of Death comedy show(the other mind behind the show was Timandra Harkness). Recent disasters have taught some people two things: disaster relief shelter is incredibly important and disaster relief shelters have major issues. It was with those thoughts in mind that Vinay Gupta created the original Hexayurt, a zero waste relief structure that can be built from basic materials that already exist in most supply chains, plywood and nails. They were very simple and very small structures, so when he wanted to create an expanded version of the hexayurt he enlisted the help of University of Arkansas mathematician Edmund Harriss.